The US Department of Justice (DOJ) civil forfeiture suits have provided the most extensive documentation on the 1MDB scandal to date with damaging claims against the troubled Malaysian sovereign wealth fund and its key players. While many BN leaders have chosen to remain silent, Umno, in particular, has been on a counter-offensive, accusing the US of foreign intervention or even trying to overthrow a Muslim government. However, even before the DOJ filed its first civil forfeiture suit in July 2016, it was the Swiss authorities which had first gone public with its investigation into 1MDB. 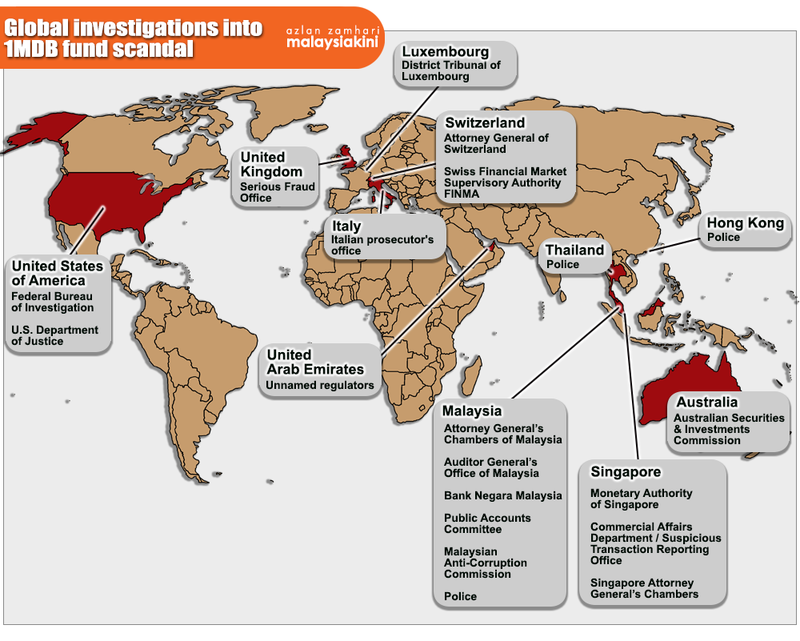 Switzerland's Office of the Attorney-General (OAG) announced on Jan 29 last year that it suspected around US$4 billion had been misappropriated from the Malaysian fund. It had requested for mutual legal assistance from Malaysia and did so again on Oct 10 last year in relation to a further US$800 million linked to former 1MDB subsidiary SRC International Sdn Bhd. Malaysian attorney-general Mohamed Apandi Ali had snubbed both requests. But despite being the first to go public on 1MDB, the Swiss authorities have released information sparingly to the public compared to the DOJ. A contrast between the two is that the Swiss authorities are building a criminal case while the US one is a civil action, even though the DOJ has refused to say if criminal actions will follow. Switzerland's OAG in an email reply to Malaysiakini said a criminal case is pending and that was why it had not released further information. "Please take note that in Switzerland, pending criminal proceedings are, by law, confidential and we are generally bound by investigation secrecy. "That’s why no further information can be given by the Office of the Attorney General of Switzerland at present," a spokesperson told Malaysiakini. While the OAG had previously cited sums of US$4 billion with regard to 1MDB and US$800 million in relation to SRC International, it said that "criminal proceedings are dynamic processes" and the cited amount could change. The DOJ in its first civil forfeiture estimated more than US$3 billion was misappropriated from 1MDB but the figure was later revised to US$4.5 billion in its third suit filed last month. 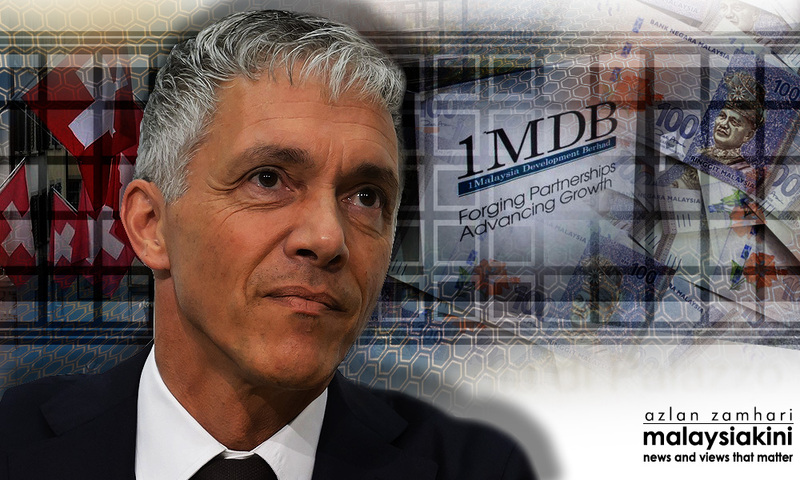 The Swiss OAG had commenced investigations in relation to 1MDB as early as August 2015 and had met with Mohamed Apandi on Sept 15, 2015 in Zurich over the matter. Swiss attorney-general Michael Lauber (photo above) said Malaysia refused to provide assistance on grounds that it would prejudice a criminal matter back home but said he would press on with the help of other countries, including US and Singapore. While the criminal action is pending, the Swiss Financial Market Supervisory Authority had already swung into action, ordering the closure of BSI Bank, confiscating 6.5 million Swiss franc in illegal profits from Coutts & Co Ltd and reprimanding Credit Suisse. It had also commenced a criminal action against Falcon Bank and ordered it to surrender 2.5 million Swiss franc in illegal profits. All these Swiss-based banks had handled funds that were allegedly diverted from 1MDB. Its European counterpart, Luxembourg Financial Sector Supervisory Commission, last month also fined private bank Edmond de Rothschild, which had handled 1MDB-linked funds, EUR8.985 million. Meanwhile, criminal action in Singapore had already commenced with the first trial taking place in October last year. Four bankers have since been jailed. The Singapore Monetary Authority also ordered the closure of BSI Bank and Falcon Bank in that country. It also fined Credit Suisse, UOB Bank, DBS Bank, UBS Bank, Coutts Singapore and Standard Charted a total of SG$11.5 million.